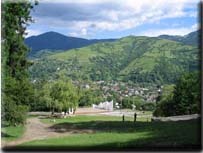 Rakhiv is the most highland town in Ukraine. It is situated in the north-east eastern part of the Transcarpathian region in mountain basin at an altitude of 430 m above sea level. The geographical �adress� of Rakhiv is 48º of northern latitude and 24º15` of eastern longitude. There is a great elevation here � from 400 to 900m. above sea level. In the east of Rakhiv the Inner Gorgany in the west there is the Svidovec, in the north - Chornogora (mountain parts of polonynskyi range) in the south � Rakhiv mountains. Mountains which encircle Rakhiv are characterized by a great diversity of fauna and vegetation. Vertical vegetation belts of the Ukrainian Carpathians are very distinct in this area: beginning with foothill oak forests, to mixed beech-spruce fir and pure spruce stands; and up to subalpine and alpine belts (crooked woodland and high alpine meadows -polonyny ). Within the flora of the are such rare and endangered species are found, as Galanthus nivalis, Lilium martagon, Coronaria flos cuculi, Pulsatilla alba, Leontopodium alpinum. The total area of the town is 524,2 ha. The population is 17.000 people: 76% of Ukrainians, 12% Hungarians, 5% Russians, representatives of other nations � 7%. According to the official statement Rakhiv was founded in 1447. There are several versions of the origin of its name. One of them is connected with a proper name Rakh, Rakho; the next one is connected with merchants traveling from Transilvania and Hungary to Halychyna, and stopping in this place to count their profits. At this territory opryshky calculated the money they`ve taken from rich people. 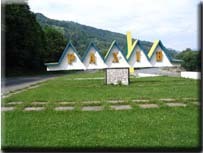 Thanks to geographical position, unique nature and original Hutsul culture Rakhiv is famous as one of the well-known recreation and tourist centers of Ukraine. There is a tourist center in the town. A number of hotels, private houses are always ready to welcome you and provide with the services of a very high quality. Further information about tourism in Rakhiv you can find in the chapter �Tourism�.